This week's lesson is a reminder that if we simply focus on Christ and his ability to save and redeem, we will live. If we, however, turn away from Christ and his salvation we will perish. Often we turn away from Christ by murmuring and complaining and wishing we did not have to follow His way. Sometimes this murmuring can take on the form of criticizing our church leaders (the Lord's anointed servants). Christ's way is uncomplicated but requires courage and faith...and sometimes just a bit more discipline (discipline comes from the same root word as discipleship). v.1 "and when the people complained it displeased the Lord" see also Doctrine and Covenants 59:21 Why does this displease the Lord so much? Why is it only ingratitude and disobedience that make him angry? What can we learn from this as parents? "Depart, I pray you, from the tents of these wicked men, and touch nothing of theirs, lest ye be consumed in all their sins." "Anyway, like I was sayin', shrimp is the fruit of the sea. You can barbecue it, boil it, broil it, bake it, saute it. Dey's uh, shrimp-kabobs, shrimp creole, shrimp gumbo. Pan fried, deep fried, stir-fried. There's pineapple shrimp, lemon shrimp, coconut shrimp, pepper shrimp, shrimp soup, shrimp stew, shrimp salad, shrimp and potatoes, shrimp burger, shrimp sandwich. That- that's about it." The children of Israel did not have the child-like delight in manna that Bubba had with shrimp. Instead they complained. Is it coincidence they lusted after meat rather than the spiritual manna? Are they symbolically rejecting all that is heavenly for mortal pleasures? Do we tire of spiritual food and lust after/follow more physical appetites? v.11-15 Moses here seems to be venting something like this "Surely you didn't call me to be a babysitter. This is killing me. How am I supposed to provide meat for them?" I will feed the people meat "until it come out at your nostrils" and they are sick of it! Or in other words: "Are you kidding me? Didn't I just feed 2 million people manna? Are you suggesting that I am incapable of doing this now?" v.24-30 two of the seventy prophesy and it is reported back to Moses as if they are trying to usurp Moses' authority. Moses reply is that he wishes all the people were prophets. I find this interesting. Firstly, it makes you wonder if there was a little rebelliousness creeping into the camp regarding Moses' authority. This reaction to the two men prophesying suggests there were some that were worried the two men were trying to become the leaders and take over Moses' position. Moses' reply suggests however a leader who was confident and lacking in any insecurity. Also interesting in Moses' reply is his idea that all men could be prophets. Moses clarifies for us here the difference between being the prophet and being a prophet. v.31-35 quail cover the land in all directions for a day's journey, two cubits deep (about 3 ft deep). v.33 refer back to verse 1. What are the only 2 things that make God angry? Which of those do you think made him angry here, this time? v.34 they lusted - followed their body rather than remembering and following their Lord. This is another fascinating story. v.1-13 Miriam (Moses' sister) does not like Moses' decision to marry an Ethiopian woman and suggests that he has lost his authority and that she and her brother Aaron have as much right to be the leaders as Moses. The Lord summons her, Aaron and Moses to the tabernacle and proceeds to explain that prophets can be called by dreams and visions but that is not Moses. Moses is greater than that and converses with the Lord face to face. His question is powerful "Wherefore then were ye not afraid to speak against my servant Moses?" What a great and powerful way to back Moses up on this. He doesn't say anything more. Just leaves and leaves Miriam with leprosy. What powerful symbolism is the Lord using here? This punishment had a dual effect. Anyone thinking of following Miriam now has a choice. Follow this person and you too will be cast out of the camp as a leper and possibly even punished the same way. So in a very real way it acts as a deterrent to all who see her, not to follow this woman and rebel against Moses. In a spiritual way it also very clearly shows the end result of rebelling against the Lord and his servants by trying to do things your way - spiritual decay and damnation will follow. Aaron asks for mercy and Moses pleads with the Lord for Miriam to be healed. v.14-16 The Lord decides Miriam's offense was severe enough that she must endure the punishment for 7 days. The people made no progress at this time. I wonder if the Lord was making them sit and ponder what had happened here? v.1-16 one leader from each of the tribes is sent to spy on the land of Canaan. The tribes of Judah and Ephraim send Caleb and Joshua. v.16 Joshua was originally called Oshea which in Hebrew means salvation in a general sense. The fact that he was given the new name, Jeh-oshua is very significant. The new name also means salvation but not in general. Adding the "Jeh" signifies adding Jehovah to the principle of salvation already in his name. Thus here again we have an example of the children of Israel very pointedly being shown that it is Jehovah that brings them salvation. His name change is indicative of the struggle the children have in remembering who it was that they should look to for their salvation. Their natural instinct was to just celebrate being saved without remembering who it was that saved them. Joshua, in receiving his new name, became a living symbol and reminder that salvation only comes through Jehovah. v17-20 Moses gives instructions for the spies reconnaissance mission. Are the people strong or weak, few or many; is the land good or bad, are they in tents or walled cities; was the land rich or poor and did it have strong trees and bring me fruit. v.21-25 They do as instructed. Israel's Ministry of Tourism marks this event today with their logo, depicting Joshua and Caleb as they carry back the grapes on a pole. v.26-33 Most of the spies return (after 40 days) saying the people are too big and too strong to be defeated but Caleb of the tribe of Judah suggests the opposite and thinks they could easily overcome them. v.1-5 people do their usual murmuring, wishing they were back in Egypt and decide to choose a leader to take them back. v.6-10 Joshua, Caleb, Moses and Aaron all plead with the people to trust God and believe the report that the land can be easily overcome. But the people move to stone them. v.11-39 The Lord's patience with his people wears thin after they murmur against him the tenth time and he curses the people that only the younger generation (below 20 yrs old) will inherit the promised land. Everyone else will wander in the wilderness for 40 years (each year symbolic of each day the spies were in the land of Canaan) until they die. The spies that gave false reports and made the people murmur are killed by a plague. This seems very specific that the Lord has counted ten times since they left Egypt that the children of Israel have murmured against Him. And it seems this tenth time is the final straw. Land of Canaan - murmuring Numbers 14: 1-4 - Lord's patience runs out. Can you find the other circumstances of murmuring and what the symbolism may be? Let me know when you find them. The Lord said the people murmuring outside Canaan was the tenth time they had murmured against him. v.40-45 The people try to repent but do so unworthily. They are warned that, as they turned from the Lord, He is no longer with them and so it is no longer safe to go into the promised land and do battle with the people. They try anyway but are defeated and pushed back and many killed. v.1-4 The Lord decides to fight their battles again and they are victorious but the people complain again. v.5-6 Usual complaints of rocky road, lack of water, lack of real bread, we hate this fake bread! So the Lord sends poisonous snakes among them. Many people are bitten and die. v7-9 The people seek to be forgiven. 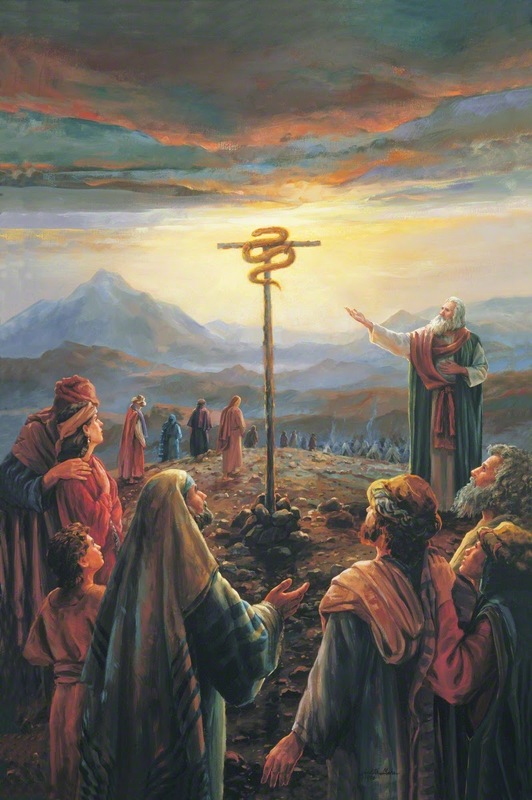 The Lord instructs Moses to make a replica of the snake and raise it on a pole. When the people that are bitten look on it, they are healed and live. 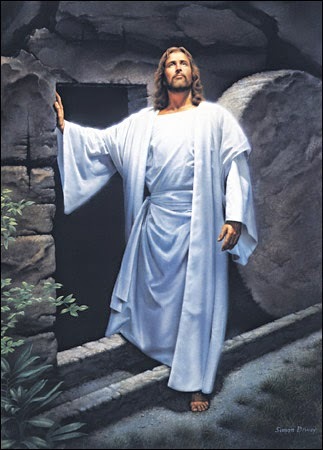 (see also 1 Nephi 17:41 and Alma 33:18-22) Why do you think people would refuse to look on this graven image? Why would the Lord ask them to look upon a graven image? What is he trying to teach the people? Follow me. No matter what I ask of you, follow me and you live. But if you do not recognize me or my word, you shall perish. (see John 3:14-16; John 10:27) Not only has this image endured in various scriptural passages over time but even in symbols of ancient and modern medicine and healing (see American Medical Association, World Health Organization etc). It is not surprising that, though the symbol itself endures, many have once more lost sight of its true meaning and import. In April 2002, President Gordon B Hinckley closed conference with these comments. For me they sum up the lesson the Lord was trying to teach the children of Israel. Feel free to watch it in its entirety but especially from 1:04 until 7:55 in the video. I know that it's a huge ask in this busy world, but have you ever thought about doing the lessons a week early on the webpage? One of the members of my ward here in Caerphilly who's friends with you pointed me toward your blog, and I find that your lesson preparation is often very similar to my own. It's nice to have those resources, but especially with the time difference, your lesson preparations generally aren't posted until after I come home on Sunday. I'd love to be able to use your study as a resource sometimes. Cadenza, I am sorry for my tardiness. I am currently struggling just to get the lesson prepared in time. Initially this blog was meant as a resource for those in my own ward who wanted to study after the lesson or who had been unable to attend the lesson. That seems to no longer be the only audience which is awesome but poses the problem you mentioned you are experiencing. I have considered doing the lessons a few weeks early but as you say in this busy world it has been a struggle. I am aware of the growing number of people reading this blog, such as yourself, all over the world and you are right. I apologize. Please be patient with me as I work towards adapting the blog and its availability to this larger audience. Thank you so much.